This smoothie bowl deserved a post of its own! Simple to make, beautiful to look at, incredibly tasty and overflowing with nutritional benefits that would make Broccoli jealous! 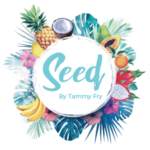 You need a blender (and if you don’t have one, but read my blog, you need to invest in one today!). I love my Nutri Ninja Blender which packs a powerful punch with 900W – so no chunky bits! My pink pitaya bowl contains 3 fruits – Pink Pitaya (Dragonfruit), banana and mango blended with coconut water or coconut milk. And then the fun begins. Top with any variety of dried fruits, granola, fresh fruit, seeds and mint. Every morning is a little challenge to make something more beautiful than the day before, not too difficult when every ingredient is stunning! My favourite toppings: dried coconut, chia seeds and kiwi fruit. As “thrown together” as all of this sounds, this concoction of ingredients is well thought out for the various nutritional benefits that these foods offer. Pink Pitaya: probably the most beautiful fruit I have ever seen! 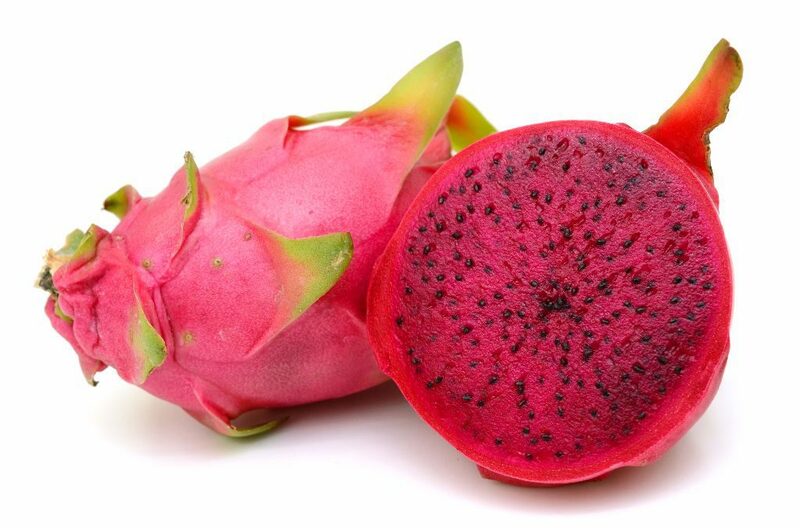 Pink Pitaya is low in calories but is loaded with micro-nutrients. Perhaps the most notable are the high levels of antioxidants and vitamin C. We recently had a flu epidemic in our town – everyone I knew got the flu, including my husband and children. I put the fact that I never got sick down to my smoothie bowls – concentrated vitamins from natural sources and not a tablet! 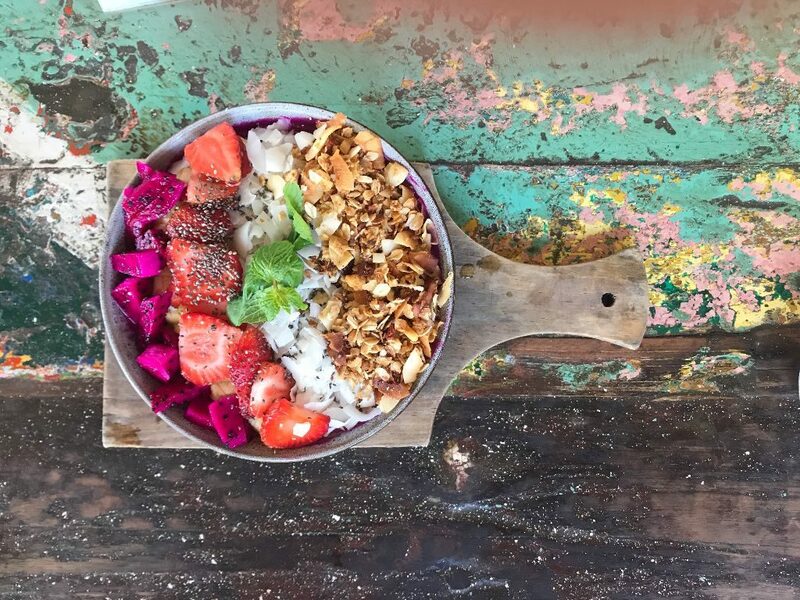 Pink Pitaya is also a good source of calcium and iron, so if you are avoiding animal products, make sure you add these beauties to your everyday diet! Mangoes are our tummy’s best friend. Rich in fibre and alkalising properties make this fruit a “must-have” addition to your smoothie bowl. If you participate in lots of sports, you may lose potassium, and mangoes contain heaps of it! Bananas, much like mangoes are also high in fibre and help alkalise the gut. They also have high levels of magnesium. This is a mineral that I am naturally deficient in and have found that by increasing my magnesium intake, I have had reduced severity of migraines (another topic for another day!). Never add dairy to your fruit! When these two are added together in the stomach, they curdle – this causes indigestion, increased acidity in the gut and a “heavy” feeling. Stick to coconut milk or almond milk! (the cows will thank you too!). I like to add granola for complex carbs – this keeps me going for longer (and I like the crunch)! The dried coconut and chia seeds – for good fats and a host of other micro-nutrients. After this smoothie bowl, I feel full for hours, energised and happy. I am sure that something in the recipe has a secret happiness nutrient!